Never mind the outcome: who SHOULD'VE won that World Cup? There’s nothing more final than an unjust football result. No appeals process exists to shake off the unpalatable, unacceptable and unfair. What can Atletico do about Real’s last-gasp leveller in the 2014 Champions League Final? And Smith Won’t Score, Brighton fans. It’s best just not to dwell on it. But what if you could go back and rewrite history in the name of Justice? And what if that was then accepted as science fact by all? World Cup fans should ask, did the right team win? And I say no, not always. 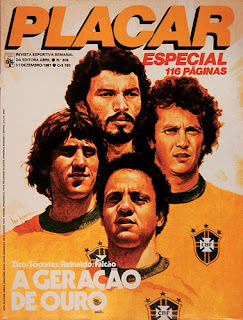 The best Brazil team not to win the World Cup? Take 1982 for example: Italy won it but Brazil should have. It would have ended a 12 year post-Pele drought. An era of Zico, Socrates and Falcao made more fabulous by the last vestiges of sepia-coloured TV pictures and excitable commentary on the phone. Of course, Italy will point to Paolo Rossi's stunning hat-trick against them - but it was a defeat to send Brazil into their shell until they exacted revenge over Italy in the worst ever World Cup Final twelve years later. A Final so bad it made Diana Ross’ Opening Ceremony penalty kick look appropriate. But one solitary ninety minutes stands above as the game that both launched a mighty nation, while chiming a knell for another. The 1954 Final between West Germany and Hungary was the ninety which changed football's direction the most. Their status’ are now so completely in contrast today, it’s hard to imagine it came about as a freak result . West Germany’s so-called Miracle of Bern. Back then, Germany was demoralised, a literally divided nation. What they wanted was a morale boost just nine years after the disaster of World War II. Their opponents, the marvellous Magyars were - well, marvellous. Imperious, brilliant - and the mantle of world champions would all but confirm an era of magnificence. Hungary had already humbled the West Germans 8-3 in the group stages and made it to the Final courtesy of victory over 1950 runners-up, Brazil and champions, Uruguay. Ferenc Puskas fractured his ankle during the Finals – but it’d be disingenuous to his teammates to blame that for Hungary’s shocker. 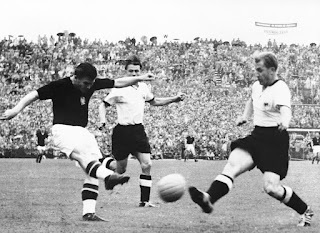 Instead, West Germany's 3-2 win launched a dynasty while Hungary disappeared from sight by 1962. Add to that Germany being disallowed from the 1950 tournament – this was their first post-war football foray. 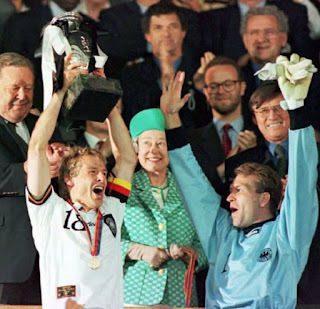 By 1990, West Germany's destiny was built on history, self-belief and structure. Those pillars helped push them past a weak Argentina. But that was when host nation Italy should've won. Fuelled by the unexpected six-shooter Salvatore Schillaci, Italy powered their way through the group stages with Toto's firebrand goals. They were cruelly denied by a semi-final penalty shoot-out loss to defending champions Argentina – but it would have been a travesty if one-man Team Maradona had retained the Cup. Andreas Brehme's clinical penalty booked West Germany's date with destiny again. And it's not just about the World Cup, it's a European Championship thing too. And that my friends, is all about England. England are so unlucky. They could've buried the mantle of Least Successful Big Nation before Spain ditched the unwanted title first with consecutive victories in Euro 2008, 2012 and the World Cup in between. It’s because Euro 96 and 2004 belonged to the Three Lions. Baddiel and Skinner’s “thirty years of hurt” seems a reasonable tariff for crimes against preparation nowadays. It’s 50 and counting. The Queen of England too excited by a German win? With ten goals, England scored more than any other in Portugal, starring the Golden Generation and fearless 18-year-old Wayne Rooney of Everton. Just as Germany seemingly strut to victory every generation, England’s defeats are magnified by frustration at the sudden failure of well, usually penalty shoot-outs. And the less we say about Wembley in 1996, the better. With the Czechs, 80-1 outsiders at the start waiting in the final, it was a gimme for the host nation at Wembley . Excuse me, I have to leave the keyboard for a couple of minutes. And while we’re on host-nations, Holland should’ve been crowned European Champions for a second time in 2000. They succumbed to Italy in the semi-final on penalties – Italy in turn, lost to a French Golden Goal despite leading in the Rotterdam Final. Greece's Plan A gameplan worked perfectly! France were already world champions and maybe, the Clairefontaine youth project deserved this outstanding double recognition – but still,the Dutch with Kluivert, Overmars, Davids, Stam and van der Saar deserved to emulate the Gullits and van Bastens of a generation earlier. On the other hand, England's bad luck aside, no one can argue with Greece winning Euro 2004; Otto Rehhagel’s procession of one-nil wins was a masterclass of gameplan – nor with Denmark’s romp to Euro 92 glory when UEFA pulled them in from summer holiday deckchairs to replace war-torn Yugoslavia. As for England,’66 made up for the World Cups they carelessly didn't bother with in the thirties. Our common memories make the thin-line between success and failure an open wound. What a pity there’s no revisionism in football.